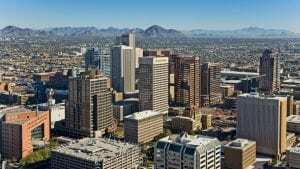 Phoenix, Arizona had $2.6 billion dollars’ worth of office assets exchange hands in 2018, and experts are saying there is still plenty of room for prices to grow. When compared to 2006, the office investment sector was on par for 2018, but prices per square foot are still well-below the peak market during 2008. Phoenix has caught the attention of U.S. and foreign investors, which has not had a presence before. There is a new diversity in capital which is attracting more investors to the Valley of the Sun. Some of this new activity is due to higher commercial prices in other markets, making the lower prices in Phoenix very attractive to investors, who may have been squeezed out of higher priced markets. When you can buy for less than it would cost to buy, that is a smart purchase with a continued upside. Approximately $1.6 billion in office product is currently under contract or scheduled to come onto the market in the first quarter of 2019.